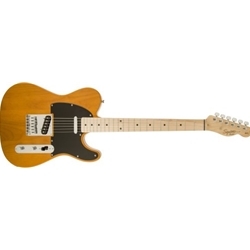 Want a butterscotch blonde Tele? Now you can own a Squier Affinity Series Telecaster Special for a great low price. No matter what your budget. This special-run guitar is a Fender-designed beauty. Sporting the most famous of all Telecaster finishes on an alder body, with bolt-on maple neck and maple fretboard with dot inlays. Also features a 25-1/2" scale length, with medium-jumbo frets, and two legendary Fender single-coil pickups. At this price, you canTMt go wrong!